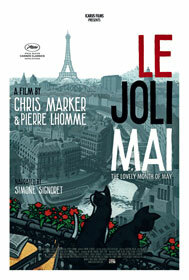 "A far-reaching meditation on the relationship between individual and society" (Film Comment), LE JOLI MAI is a portrait of Paris and Parisians shot during May 1962. 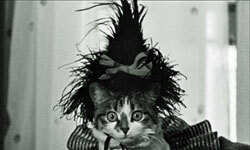 It is a film with several thousand actors including a poet, a student, an owl, a housewife, a stockbroker, a competitive dancer, two lovers, General de Gaulle and several cats. Filmed just after the March ceasefire between France and Algeria, LE JOLI MAI documents Paris during a turning point in French history: the first time since 1939 that France was not involved in any war. Part I, "A Prayer from the Eiffel Tower," documents personal attitudes and feelings around Paris. A salesman feels free only when he is driving his car, and then only if there is not too much traffic. A working-class mother of eight has just gotten the larger apartment that she had been wanting for years. The space capsule of American astronaut John Glenn is examined by a group of admiring children. Two investors talk about their careers and adventures. A couple in love since their teens discuss the possibility of eternal happiness. At a middle class wedding banquet, the guests are raucous while the bride is quiet, dignified and reserved. Part II, "The Return of Fantomas," is an investigation of the political and social life of the city. Marker and Lhomme alternate between public events and private discussions: the former focusing on the Algerian situation, such as a funeral for people killed in Paris street demonstrations after the Algerian settlement. Meanwhile, the latter includes a conversation with two girls about the state of France; a meeting with a pair of engineers who describe the potential of the current technological revolution; a n African student who discusses his own response to the French and the Parisians' reaction to his skin color; a worker-priest forced to choose between the Church and his fellow workers; and an Algerian worker describing conflict he has experienced with native Frenchmen. 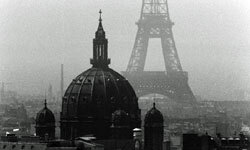 The film ends with sweeping views of Paris, the facades of its prisons, and the faces of its people as they struggle to make sense of their moment in history.